Charles A. Hones, Inc. has been designing and manufacturing metal melting furnaces for non-ferrous, semiprecious, and precious metals as well as other alloys since 1911. Our high performance metal melting equipment offer superior melting speeds, high energy efficiencies, wide temperature ranges, and excellent safety features at reasonable prices. Topnotch craftsmanship ensures that our metal melting equipment can withstand several years’ worth of heavy duty use. 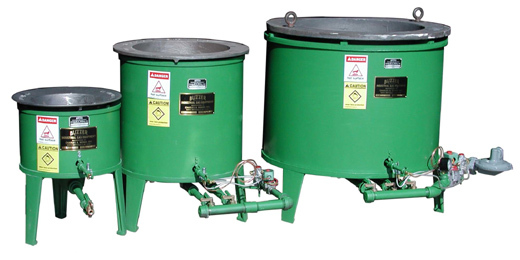 Metal melting furnaces manufactured by Charles A. Hones, Inc. are available in six standard sizes from 160 lbs. lead capacity up to 2,700 lbs. lead capacity. All melter’s are rated for use up to 1,000OF. Furnaces can be used to melt lead, tin, solder, babbitt, bismuth, pewter, and related white or soft metals and their alloys. Furnaces are insulated with up to two inches of 1,200OF block insulation; this combined with a double wall steel jacket construction will melt metal down quickly using low “household” pressure natural gas or propane. For example our No. 500 furnace will melt down 500 lbs. of lead in 45 minutes using only 75,000 BTUH. The furnace promotes value in that their modular design reduces fabricating time, making pricing very competitive. Standard package would include a cast iron pilot, cast iron burner, thermopilot flame safeguard, 0-15” w/c gas pressure gauge, slow-opening combustion valve, digital temperature controls and heavy duty cast iron pot. Buzzer melting furnaces can be used for non-ferrous die casting, art casting, sand casting, precision casting, and many specialty casting processes such as spin casting or vacuum casting. Melters are also used to perform zinc (hot dip) galvanizing, soldering, and babbitt coating. They are popular with industry, trade schools, laboratories and artisans. Our company continues to uphold our founder Charles A. Hones’s commitment to craftsmanship and manufacturing high quality products to meet your requirements.